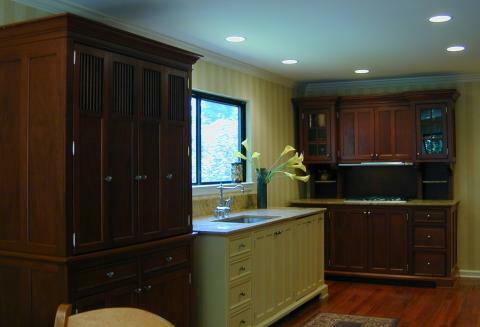 This kitchen made entirely of unfitted workstations combines with an informal dining area to form the heart of this Long Island, New York ‘Over 55’ condominium. The homeowners designed their kitchen during a single meeting in YesterTec’s showroom. They wanted it to be a collection of furniture, because they could see it from the foyer, dining room, living room and breakfast room, and they did not want it to look like a normal kitchen. They had a lot of artwork and sculpture and liked the idea of a kitchen that was filled with 3-D sculpture like pieces of furniture unspoiled by the look of imposing appliances. Hiding the appliances in the pieces gave the kitchen an uncluttered look as well. 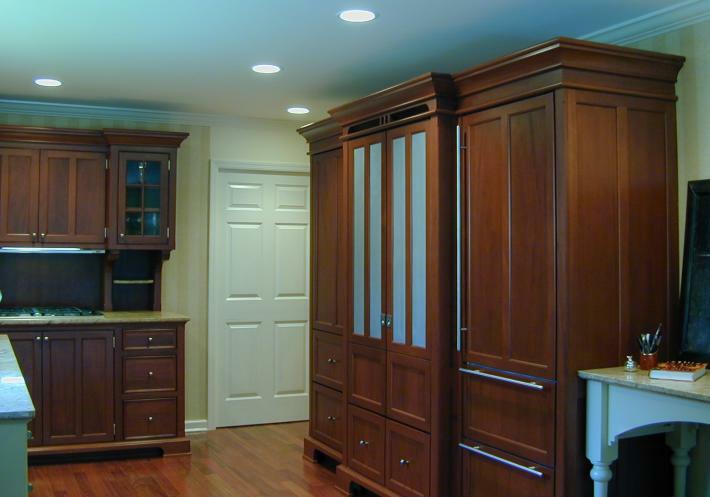 The image above features an armoire made from combining a Subzero 700 refrigerator/freezer (right) with a concealed oven and microwave (center) and a full height pantry (left). The photo below features a Working Pantry that stores all the small appliances, an Ochre painted Sink unit with an integrated Bosch dishwasher (center), and a Range (right) that includes a gas cooktop and a slide out telescoping exhaust hood. All workstations are finished in Hampton’s Mahogany except the sink. Please click on the following link for more information about this unfitted Condo Kitchen.